Editor’s Note: This issue of the Weekender features bars from the Greater Lewis County area. We highlight five bars, including the newest one on the scene — McFiler’s in downtown Chehalis — and add a list of over 30 establishments. McFiler’s, a new bar in downtown Chehalis, stems from almost every bartender’s dream — opening a bar with your best friends. That’s when Eddie McNally, a longtime best friend, suggested the two begin putting away money to purchase their own bar. Filer, Eddie McNally and his brother Patrick McNally finally pulled the trigger last spring, and bought the building which once housed Rumors Bar & Grill. Filer and Eddie McNally worked with their family and friends to completely renovate the building over six months. Patrick McNally, who lives in Texas and works for SpaceX, designed the floor and deck plans. Filer told Eddie McNally what he envisioned for their bar — moving the pool tables, bar and kitchen toward the back, opening up floor space in the front and building a stage. “He was like ‘okay, let’s do it,’” Filer said. Filer and Eddie McNally originally met at the Hub Bar & Grill on Filer’s 21st birthday. Filer was a few White Russians in. McFiler’s part owner Tim Filer shows off the new bar in Chehalis. “It wasn’t well received,” Filer said. 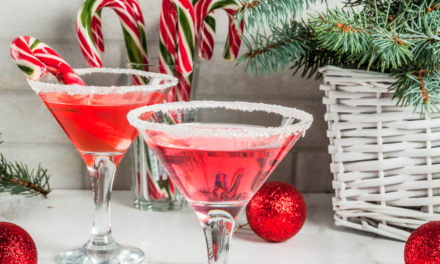 Then, the two turned their sights toward opening their own bar. Filer said they started seriously considering the proposition about six or seven years ago. For the past four years, they have been ready for the opportunity. Eddie McNally owns a software development company in Portland and has never owned a bar. It was the first time either Filer or Eddie McNally had ever taken on a major renovation. Owning a property downtown and dealing with city permits were new experiences for both of them. The owners didn’t contract any of the work during the six-month renovation. “Me, my dad, my mother-in-law, Eddie — we did all of the interior demo and the rebuild all ourselves,” Filer said. The owners said the current food menu is tentative and will grow. Eddie McNally said McFiler’s mostly serves burgers and sandwiches at this time. Additionally, McFiler’s is compiling its craft cocktail list, which is set to include many prohibition-era drinks. 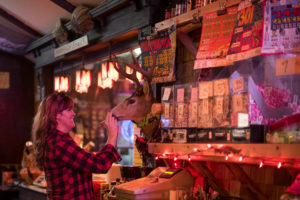 The bar allows all ages until 11 p.m.
Roxy Cupp, owner of the Brown Shack Tavern in Salkum, places a cigarette into the mouth of a mounted deer. For 99 years, the Brown Shack Tavern has been a consistent gathering place for the colorful and thirsty folks of East Lewis County. Located just a stone’s throw to the north of U.S. Highway 12 in Salkum, the Brown Shack is a hidden little gem preserved in a way that only a near century’s worth of tavern lacquer can muster. 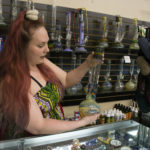 For starters, it is the only 21-and-older establishment in Lewis County that serves only beer and wine, while eschewing the temptations of hard liquor. “It’s always been a tavern since 1920,” said Roxy Cupp, owner of the Brown Shack Tavern. As the years have passed, more and more old-time taverns turned to full liquor service saloons and bars. “It’s kind of nostalgic and it keeps the riff-raff away,” said Cupp. 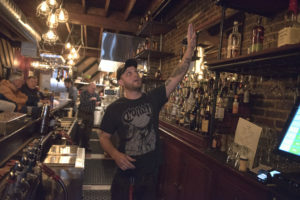 According to Cupp, the tavern typically draws an older, and often retired, crowd, although, “We bring in a lot of younger people on the weekends,” when there is live music. The absence of hard alcohol usually keeps the rabble rousers at bay though, and the regulars seem to enjoy the hassle-free atmosphere. Providing entertainment, in its many incarnations, has been a major focus for Cupp since she purchased the tavern in 2014. “I’ve just tried to liven the place up a bit,” she said. They have video bowling tournaments, and a 9-ball pool tournament as well as karaoke and live music. They recently added a full menu of food. The music is typically “old country,” with some rockabilly and bluegrass. “I love bluegrass!” said Cupp, who added that she’s also put more food options on the menu and a wider array of beers in the cooler in order to keep the masses entertained. “Owning your own bar is a lot of work. 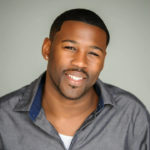 You have to prove yourself,” said Cupp. Prior to purchasing the Brown Shack, Cupp had no experience tending bar, let alone owning one. Unlike some small town watering holes though, strangers are welcomed at the Brown Shack. 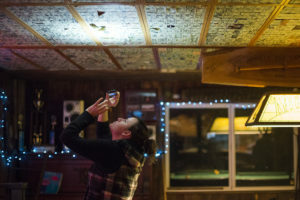 Kayla DeLoe, of Olympia, uses her cellphone to take a photo of a dollar bill that she stapled to the ceiling of the Brooklyn Tavern near Cosmopolis. The historic Brooklyn Tavern, a landmark of Western Washington’s backroad culture, has an owner who is committed to preserving the age-old traditions of the out-of-the-way watering hole. Larry Viguerie, Oakville, completed his purchase of the Brooklyn Tavern in 2016 and he has been busy rounding the place into shape since then. “When I took it over the grass was cow high. We just about had to get a hay harvester in here to cut it down,” said Viguerie. 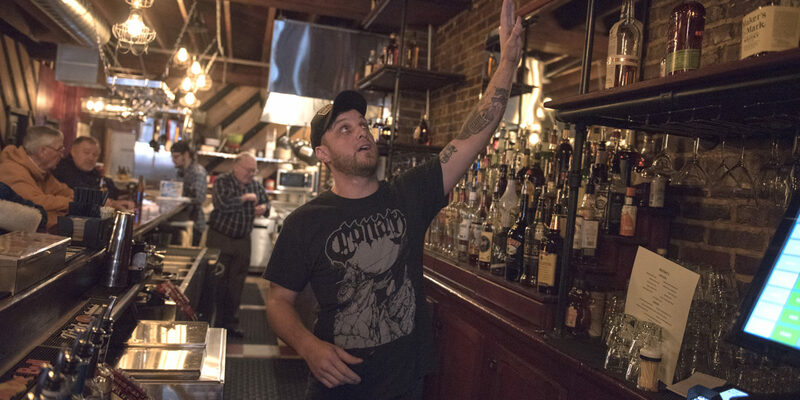 Viguerie first came to the Brooklyn Tavern years ago when his friends told him it was a fun place to go. Right off the bat he enjoyed the crowd and thought the logging paraphernalia decor provided a unique atmosphere. That feeling didn’t budge over the years and subsequent beers, so when he heard the tavern might close he felt uniquely inclined to act. 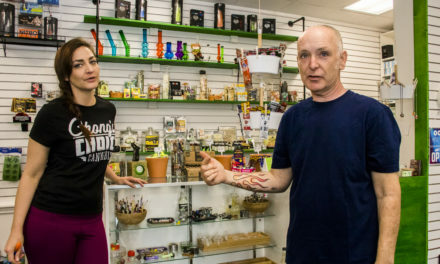 The former owners, Warren and Ciara Brough, had been in charge since 2013. He repaired the tavern’s signature feature, which is a free-flowing spitoon at the bar known affectionately as Snoose Creek. It is a unique feature the tavern shares in common with The Brick in Roslyn, of so much “Northern Exposure” fame. 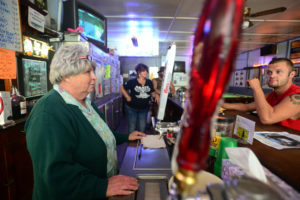 Judy Wall, the owner of Joe’s Place in Bucoda, stands behind the bar. Judy has worked at the tavern on Main Street in Bucoda for over 40 years. One-hundred-twenty years ago, Joe’s Place became the watering hole for a one-horse town. Today, much has changed — customers talk on their cellphones in the neon-lit bar, a DJ rolls his gear in a few times each week — but more has stayed the same. Joe’s is still the Bucoda hangout; the original wooden bar remains. Judy and Robert Wall are the fifth generation to run Joe’s, which has been family owned since 1898. That family history, the timeline of Joe’s Place, hangs on the walls. The decor commemorates the bar’s founder, who died behind the bar and was laid out on a nearby couch. A prison roster chronicles the names — and crimes — of many of the original local residents. And photos memorialize the many iterations of the bar, including the current building’s wooden predecessor, which burned to the ground during a 1930 fire that destroyed the block (per regulation, the building is now concrete). Judy and Robert never were sure they wanted to step into the family tradition. But when Robert’s mother died eight years ago, she left them the bar — and they took the helm. Judy is glad they did. Joe’s Place still has loyal customers. Most of the steam plant mine workers who used to go to Bucoda to cash their checks or get a bite have moved away, but many come back to visit the bar. Jones Creek Brewing owners Tim and Mirinda Moriarty opened the brewery, located just outside of Pe Ell in November 2017. Tim Moriarty said his parents bought the property in 2011, and that same year bought him a home brewing kit. “It spiraled out of control really fast,” he joked. In 2014, the Moriartys moved to Lewis County. Jones Creek Brewing keeps eight of its own beers on tap, as well as a guest cider. The brewery is located in the Willapa Hills, 1.5 miles north of Pe Ell at 173 Beam Road.